It seems that LCD concealing products are a big trend this year at CEDIA. 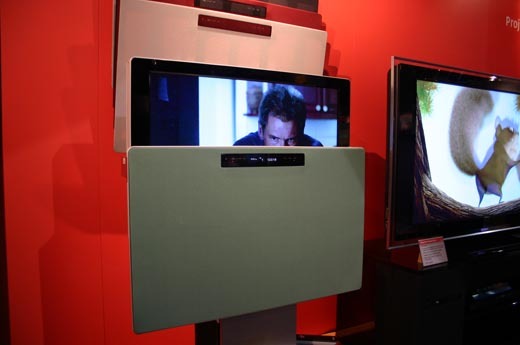 This is a Sony LCD TV that comes loaded up with a motorized, flat-speaker that can slide up and down concealing the TV leaving just the big speaker visible. The flat speaker also has an integrated DVD/CD/SACD player and FM tuner, so if you want, the TV can be concealed but you can still listen to music. The actual TV that accompanies this motorized audio unit is a 32-inch LCD with a 1366 x 768 resolution. The official name of this is the TAV-L1/R and will go for $4,000. It is kind of a neat system, but $4,000 for a 32-inch LCD and fancy speaker? Sounds a bit expensive.